How did you end up at Reconsulting? I met the team and was blown away by their intelligence, inspiring behaviour, motivational attitude, and was hugely thrilled to be offered the opportunity to join them. What did you do along the way? Veterinary surgeon (yes, really); biotechnology CEO; founder of self-funded publishing company which was successfully sold to a major global publisher; angel investor; and portfolio non-executive director. What has business taught you? It sounds like a cliché, but it really is the people that matter. Too many managers talkabout it, but if you really believe it, and really work with everyone in a business (customers, colleagues and suppliers) – it does make a difference! Beyond work, I get a buzz from….? Family, food, wine and being with great people. An inspiring and visionary leader with strong interpersonal skills and high emotional intelligence. Douglas initially qualified as a veterinary surgeon. After three years in general practice, he worked in the pharmaceutical and biotechnology industries in increasing leadership roles, ultimately as CEO of a biotechnology company based in Cambridge. 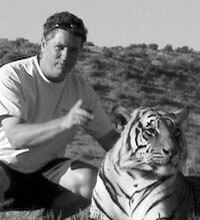 In 1990, he founded Veterinary Business Development which grew to be one of the largest communications companies in its sector worldwide. It published market-leading titles such as Veterinary Times and the Veterinary Business Journal, and was sold to the global corporation Wolters Kluwer in 2000. Douglas currently invests in a number of early stage companies in a variety of sectors and acts as a non-executive director to several. He is Chairman of BioMedical Business Partners, Non-Executive Director of Hallmarq Veterinary Imaging, and a Trustee of the Royal Zoological Society of Scotland. He has been a Non-Executive Partner in the global executive search firm, Odgers Berndtson, since 2005. Douglas finds the Reconsulting style of management consulting refreshing and rejuvenating.